2019 Summer Camp at UCPA! As the time for the summer break of the kids comes nearer, parents dread hearing their children complaining about feeling bored. After all, there is a limit to the entertainment a child can have through games or CD’s. Hence, many parents across US are increasingly taking the wide decision of sending their children to Summer Camps for Kids, instead of hearing them crib about boredom. In fact, not only Americans, but people across the world are recognizing it as the most favored choice for spending summer holidays. Some reason for making summer camp a necessary part of every kids life are given below. •	Kids and teens get ample opportunities to indulge in a variety of games and activities, which they don’t find at their local sports centre or parks. Summer camps for kids enable your child to enjoy activities like archery, pottery, high ropes courses and quad biking, to name just a few. •	Children naturally feel bored, if they have to repeat their daily mundane tasks en during holidays. However, at summer camps for kids, kids and teens get to learn new skills while enjoying themselves. •	Summer camps offer great opportunities to meet and befriend kids and teens from other schools, cities, states and countries. Kids learn about the existence of bigger and diverse societies and their exciting customs and interesting people. 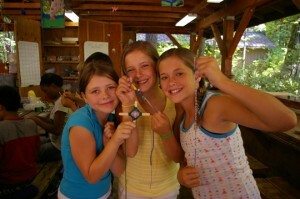 •	Youngsters learn to be independent, self-reliant, confident and creative at summer camps for kids. Besides learning new games and skills, they also become more tolerant and cooperative. •	Summer camps for kids can improve your child’s health by exposing them to fresh air and exercise rather than sitting home for watching TV or playing video games The safe and friendly environment in summer camps for kids enables them to have a really good time. The uniqueness of every child makes it imperative to recognize their specific needs according to their age, skills, hobbies and interests. The Camp Professor offers assistance in recognizing your child’s interests and chooses a camp or teen program that will be most beneficial for them. Their vast network of summer camps, facilities, and programs offer you a wider and better choice. Summer camps for kids – fun ways to beat the heat! HAPPY EASTER from all of us at UCPA! We are open for classes this weekend! WE are so excited to announce that Developing Dreams Foundation will be offering a Music Production Workshop at UCPA on May 11th! Want to learn to make beats? This is the workshop for YOU! UCPA welcomes SHARA KIDDY, former Miami Heat Dancer! © 2019 Acting Classes Dance Classes Voice Lessons Performing Arts for South Florida. All Rights Reserved.